This is the perfect gift idea for all the mustache enthusiasts that you know. Mustaches are always cool, but now they can also be downright frigid. 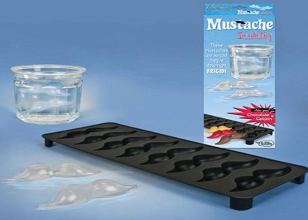 With this quirky tray, you can mold ice in your favorite shape: the mustache. This silicone Mustache Ice Cube Tray makes 8 perfect ‘staches that will reduce the temperature of your drink to the perfect point. Also great as a candy mold. Enjoy!! This entry was posted in Food and Drinks, Household, Kitchen and tagged drinks, for men, funny gift ideas, funny gifts, gag gift, gag gifts, gift ideas, gifts for men, humor, ice cube tray, mustache, party, unique gift ideas, unusual gifts.